Indonesian earthquake:- before and after imagery of the Balaroa landslide. Image Copyright: Pleiades © CNES (2018), Distribution: Airbus DS. Map produced by LAPAN. Indonesian earthquake: landslide damage at Balaroa. Image by Antara Foto/ Hafidz Mubarak A/ via Reuters. The article quotes Sutopo Purwo Nugroho, spokesman for the National Disaster Mitigation Agency: “We don’t know how many victims could be buried there, it’s estimated hundreds”. Planet Labs image of landslide south of Palu. Image courtesy of Planet Labs, used with permission. 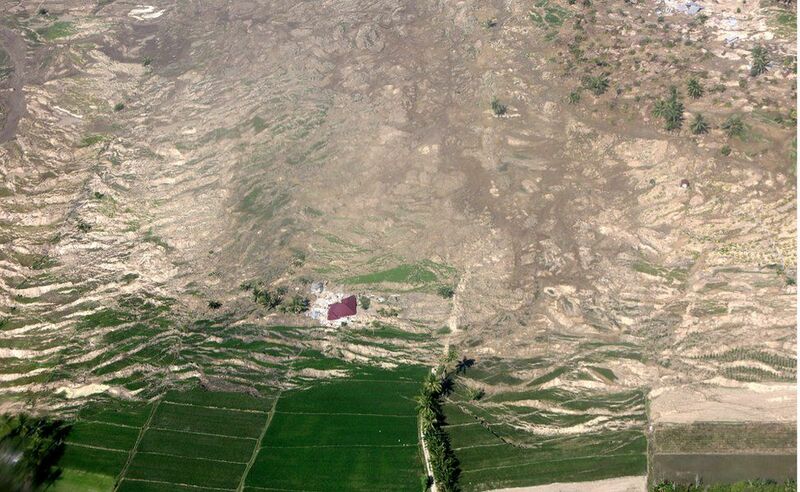 Indonesian earthquake: an example of a larger landslide to the south of Palu. Image courtesy of Planet Labs, used with permission. This landslides, and indeed most in this area, did not have the high mobility of the landslides in Palu, and so are probably not liquefaction-initiated flowslides.